Tolls were initially set at $2.00 per passenger vehicle in 1993. Those increased to $2.50 per passenger car in 2004 and $3.00 in 2010. As of 2013, the Bridge Authority still had $260-million in bonds to pay off.1 Revenues from tolls collected are also paying for the Mid-Bay Bridge Connector, a limited-access expressway bypassing Niceville between Florida 85 and the bridge. The first segment of that roadway opened in May 12, 2011, realigning the route away from White Point Road to a single point urban interchange (SPUI) with Florida 20. A short extension followed by September 16, 2011 to a diamond interchange with Range Road on the Eglin Air Force Base border. 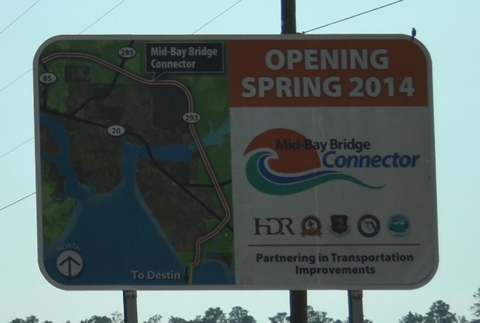 This sign advertised a spring 2014 opening date of the Mid-bay Connector at the now trumpet interchange between Florida 85 and Florida 293. Long range planning calls for the Niceville bypass to continue southwesterly as part of a toll road to Florida 87 near Holley. Photo taken January 25, 2013. Lakeshore Drive eastbound at the northbound ramp for the Mid-Bay Bridge Connector. 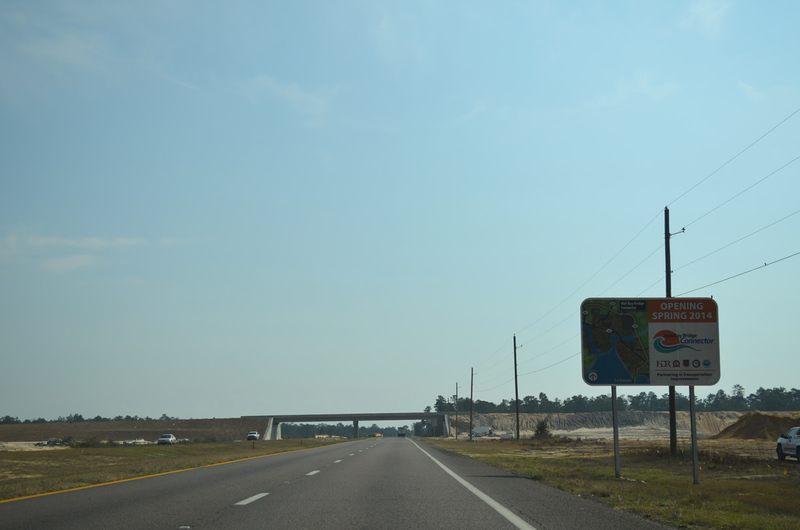 All standard Florida shields for SR 293 were replaced with Toll markers when the Mid-Bay Connector was completed west to SR 85. Photo taken 09/16/11. Second photo taken 05/22/14. A standard Florida 293 shield assembly directed motorists onto the Mid-Bay Bridge south from Lakeshore Drive east. Photo taken 05/13/11. A small mileage sign lists the distance to Range Road, the end point of Florida 293 north until January 2014. Photo taken 09/16/11. All traffic departed for Range Road just east of Niceville as Florida 293 ended. Photo taken 09/16/11. Range Road leaves a residential area of Niceville to meet the Mid-Bay Bridge Connector at the boundary of Elgin Air Force Base. Photo taken 09/16/11. Florida 293 was extended by about a half mile from Florida 20 to Range Road by September of 2011. Photo taken 09/16/11. 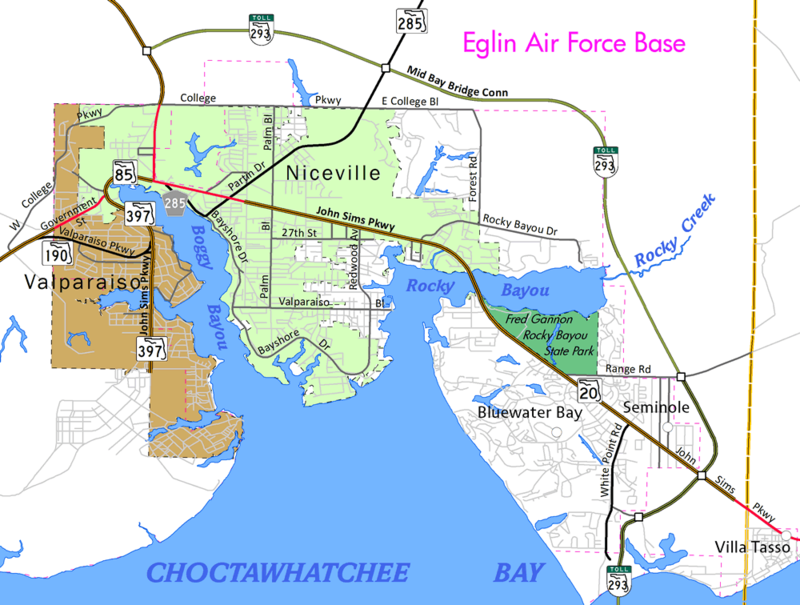 Range Road enters Eglin A.F.B. property immediately east of Florida 293. The road is restricted at this point. Photo taken 09/16/11. Exiting the grounds of Eglin A.F.B., Range Road meets Florida 293 at a diamond interchange. Photo taken 09/16/11. Florida 293 curves southwestward from the Range Road off-ramp to Florida 20, Lakeshore Drive and the Mid-Bay Bridge to Destin. Photo taken 09/16/11. Earthwork at the turn of Forest Road north onto College Boulevard west. An at-grade intersection now joins the north end of Forest Road with the Mid-Bay Bridge Connector. Photo taken 09/16/11. A set of flashers hang above the intersection of White Point Road and Woodlands Drive. Woodlands Drive connects the former state road with Bluewater Bay to the west. Photo taken 05/13/11. North of Woodlands Boulevard, White Point Road approaches Florida 20. Photo taken 05/13/11. Interstate 10 trailblazers directed motorists onto SR 20 west for I-10 west via Crestview and SR 20 east to I-10 east via DeFuniak Springs. Photo taken 05/13/11. Florida 20 constitutes a busy arterial from the Mid-Bay Bridge Connector westward to its end at Florida 85 in central Niceville. Numerous traffic lights line this stretch, which is why the Connector is being constructed for through travelers. Photo taken 05/13/11. A toll schedule sign was posted for the Mid-Bay Bridge just south of the Whit Point Road beginning from Florida 20. Note that the toll rate was still $2.50 per passenger vehicle. Photo taken 02/13/10. Whitepoint Road carried just two lanes south from SR 20 to the Mid-Bay Bridge. This view looks at the flasher at Woodlands Drive, which added local traffic to the former state road. Photo taken 02/13/10. A toll plaza sign advised motorists along White Point Road south just after Woodlands Drive. Photo taken 02/13/10. Olde Post road was the second to last turn-off available along White Point Road before SR 293 defaulted into the toll plaza. Photo taken 02/13/10. Beyond the access road for Maxwell-Gunter Recreation Area, White Point Road curved toward the toll plaza. The road now ends at a cul-de-sac. Photo taken 02/13/10. The former connection of White Point Road to the Mid-Bay Bridge. Drivers were notified that passing is not allowed on the two-lane span. Photo taken 02/13/10. "Mid-Bay Bridge a vital transportation link despite controversies." Northwest Florida Daily News, June 25, 2013. "Mid-Bay Bridge Connector to open in coming months." Northwest Florida Daily News, September 19, 2013. "Mid-Bay Bridge Connector to be unveiled after four years of work." Northwest Florida Daily News, January 3, 2014.